Sometimes you find something good...and I did.. I ran in, but no sign and still marked $99. I asked a sales lady, and she went and checked...could it be?? The sales lady quickly grabbed 2 for herself..she had just arrived at work. She went in the back room and saw all the employees had them there to buy..and they get 40% additional discount.. I am joining Mary at Little Red House for Mosaic Monday...Thanks for hosting, Mary! OOO, K!! This is fabulous...I am so green with envy I could just spit! OK...well, I AM happy for you that you made that little detour!! and I am so jealous, those weren't on sale when I was there. I would grabbed it! Do you have the small bowls, too? You are good, but if you worked there, there'd be no stock for anyone else, LOLOL! Great deal, I am also jealous. I can't wait to see what you use it for. I think, more often than not, at our Wm-Sonoma, when there's something significantly marked down that the sales people grab them up for families and friends, etc. Definitely, a wonderful perk for working there. Who could blame them! What a deal! I never seem to find deals like that...lucky you. You deserve to find that kind of deal after the ordeal you have been through! Glad to see you back. Hell...that's a good one, the perfect name for them. I am sooooooooooo excited to see the bowl. It looks better than I remember them! I love the fall change of your blog. I have to get there, but I still don't want summer to end. Thankfully your computer problems seem to have been solved. Was wonderful son the one who solved them? I LOVE the acorn shaped butter, the acorn shaped ramekins, and if that wasn't enough, the chocolate dipped acorn shaped cookies!!! Wonderful, terrific, inspiring!!!! Came back to check that you are STILL HERE :) and I love the new fall banner pic! and the mosaic! Wow, who could pass up a sale like that. It certainly sounds like a great place to work with another 40% off. Kathleen, only YOU could sniff out such a bargain! Hopefully your shopping luck made up for a little of the computer problems...and your mosaic is wonderful...Happy Sales!!! Soups would definitely taste delicious coming out of that beautiful piece! ... and less than $13? Lucky you! So sorry about the computer issues, so frustrating. Hope you get your dell problem resolved so you can get back to normal. Great find! Those treats in your mosaic look divine! Love it! Mosiac's...no idea how to make one. I am still working on getting music on my blog..and you should see the mess I have made of that! DELL! I spend over 9 hours online to them once trying to get my computer fixed. It started in the morning and by that evening I was in tears and actually feeling ill and without knowing it, I was beginning to cry! I had to ask them permission to go potty. I couldn't even eat. I was hooked by phone to a country where it was difficult to understand what they were saying and I struggled with that. They left me hanging for ages while they conferred to others...it was a nightmare! It has been awhile since I have had to go through it and the computer was brand new at the time! Every time any little thing happens now...I hold my breath. So far..so good. Twice on line with them...and I live in fear!! Stark fear!! Sorry, I got carried away when you mentioned DELL from HELL! Hehehe, I just can't help but laugh at Dell's transformation to Hell. Too bad, I have the same experience with the unit, it busted after a power failure. And now for the real thing, that's a great bargain and good find! Your desserts look so yummy! Maybe that's why they weren't marked..all the employees wanted them! And you only bought ONE???? You are definitely the QUEEN of bARGAINS!! Forgot to mention I love your mosaic..yummy! AND..your new header..heading into fall! Oh my goodness!! Great bargain! I just bought four of the small bowls (soup? ), at Marshall's @ $3 each. I thought they were a bargain, but you have mine beat with this deal!WOW! I have had a couple of "experiences", with Dell myself! You have my sympathies!! I used to work at WS - I never, repeat never, brought home a paycheck! Between Pottery Barn and WS, I furnished our home in Florida on a budget! What fun! Love your photos. WOW! What a great deal! Colour me green with envy. I have heard so many similar stories about Dell. No way I'd *ever* buy one the way things stand now. I LOATHE the way so many companies are outsourcing their customer service to countries where the personnel can't string 2 english words together. Keep it in-house, and language appropriate, wherever you may be! Lucky Duck! You snagged a beautiful thing. Doesn't it feel good when you have your eye on something and it goes on sale? I would work there in a heartbeat, but they probably wouldn't like me hobbling around and stashing all the good stuff for myself. 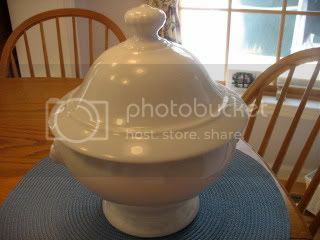 I can't wait to see what you put in this gorgeous tureen. Knowing you, it will be something stupendous, because..well, that's just you! Have a super labor day!!! Wow, what a GREAT deal!! It's like you almost got it for free and just paid for the sales tax! Thanks for sharing your fall favorites mosaic ... looks yummy! Oh my gosh, you hit GOLD, Kathleen! $99 marked down to $12.99 is amazing. I sure hope we get a Wm Sonoma outlet near us one day! I stopped at the closest big outlet today myself and the place was a zoo! You could barely drive. Wonderful bargain, and your mosaic is filled with fall goodness. Hooray, you are back here and looking great. We just don't get deals like that here in Canada. A sale to us is 10% off and if they are really on roll we might get 20%. Woo hoo. Not. Another yummy mosaic! 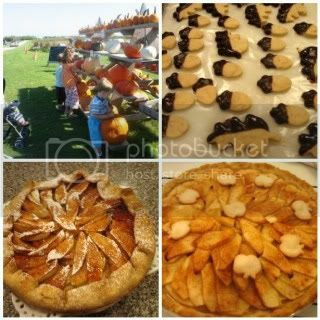 Nothing like pumpkin, fall, and pies! yum! I bow to my queen of bargains... You are the best Kathleen! It goes to show that it never hurts to ask. I'm glad you back up and running. Thanks for joining in on 3 or more, and thinking about the 3 projects challenge. You can join in any week and show us a project you have finished. Oh My!!! You hit the jackpot...I was at the W.S. outlet yesterday here in Georgia and looked at both the big turreen and the small soup covered bowls and that turreen was $60.00 on sale....they had 40% off..
What a great buy on the covered bowl! I love your new fall header and the mosaic. Well, Dell may be hell, but HP is worse! They don't honor their warranties and blame the customer for any computer malfunctions. HOLY SMOKES 12.49 FOR THAT COVERED BOWL???? You are the Queen. And here we detoured through downtown Riverhead to avoid Tanger and its environs. Dang. Wow, when W/S says Sale, they mean SALE, don't they? Gorgeous covered bowl, such graceful lines..love it! I would have gotten 3 or 4 for gifts too! Hi Kathleen! Oh, I'm so sorry about your puter problems! This can be so frustrating! Now that tureen is wonderful and what a deal! Man! I wish I lived close by, I'd help you shop! 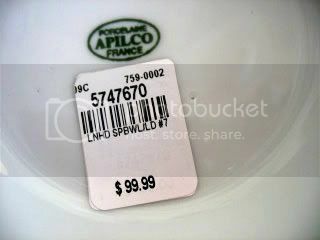 My brother and his wife were registered for Apilco dishes when they got married and I remember how pricey the stuff was when we purchased some for them. Yikes you got a great deal!